St. Paul officials say the Charlie Brown hotline is one of the hottest lines in town. Many in the capital city are optimistic the follow-up to last summer's popular series of Snoopy statues will be even more successful. 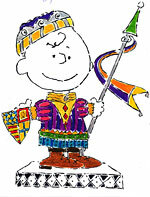 The promotion is part of the city's tribute to St. Paul native Charles Schulz, the creator of the Peanuts comic strip. Organizers say dozens of St. Paul businesses have lined up to sponsor the Charlie Browns. These are three of the 550 designs submitted by local artists for the Charlie Brown Around Town promotion, which will lead to some 100 Charlie Brown statues located throughout St. Paul this summer. THE PRESIDENT OF THE ST. PAUL CHAMBER OF COMMERCE, LARRY DOWELL, remembers the day last summer when a national sports radio talk show called him to do a live interview in advance of the National Hockey League's return to Minnesota. "I was kind of excited to do it. It was a national audience about St. Paul and the return of NHL hockey. So I get on the phone and the announcer says 'Let's talk about those Snoopys,'" he says. After gabbing for 15 minutes about Snoopy and the Peanuts gang, Dowell began to realize the magnitude of the city's Snoopys on Parade promotion. The 101 five-foot-tall polyurethane statues - scattered around the downtown and nearby neighborhoods - are credited with drawing thousands of visitors. This year it's Charlie Brown Around Town, and sponsors are combing through hundreds of designs submitted by local artists, choosing Charlie's adornments for this summer. Organizers plan to limit the number of Charlies to about 100, and say they already have nearly that many sponsors. Businesses pay $3,600 for a Charlie. They can use their own staff to decorate it or hire one of the artists recruited by the city for another $1,000. All designs are approved by the Schulz family and United Media. 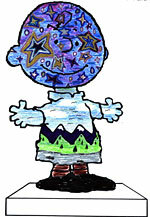 Many of the Charlie Brown sponsors paid for Snoopys last year. Tom Johnson found it was good for business for his family-run florist shop on Grand Ave.
"Last summer when we had Snoopy here, on a Saturday we'd have a line of people here waiting to get their picture taken with Snoopy. It brought an enormous amount of traffic into our store in a normal slow summertime. So we felt it definitely was paying for itself," says Johnson. Now the A. Johnson and Sons Snoopy lives on as a fountain inside the flower shop. Johnson says Charlie Brown will hold fresh cut flowers in front of the store. Kraus Anderson Construction sponsored a Snoopy last year and also donated its services to deliver the statues to their various posts around town. Vice-president of field operations, Larry Kelly, says the company will do the same with Charlie Brown. Kelly says hauling the figures give employees a first-hand look at how popular they are. He says some of the public's warm fuzzy feelings for Snoopy rubbed off onto his company. "We had an awful lot of positive response from the community - calling us and sending cookies over here and cakes over here. We were just so happy that we were involved in this," says Kelly. But businesses seem to perceive additional customers - or baked goods - as a bonus, rather than the primary reason for sponsoring a Peanuts character. Many treat the investment in a statue as a public service or charitable contribution. At Lawson Software, communications director Nancy Harrower says the company's Snoopy has been touring St. Paul schools this year and will soon be permanently awarded to the school whose students read the most books. "We don't do Snoopys or Charlie Browns because we think we're going to make some money off it. It doesn't work that way. I actually have a separate budget and department within Lawson that's focused on community outreach efforts. And it's part of being a good citizen. You hope people will want to do business with you because you do the right thing," says Harrower. Of course, mavens of pop culture may be clucking that the sequel seldom carries the impact of its predecessor. The uniqueness is certainly diminished, because a growing number of North American cities have taken to scattering whimsical statues around town. 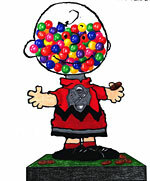 But St. Paul officials insist the popularity of the Peanuts gang can be mined for a second summer of fun. Lee Koch of the Capital City Partnership business group says the staying power of St. Paul's promotion stems from the irresistibility of Schulz' characters. "It's the lovability of the characters, I'm convinced. It is something to do with the characters . Even though in other cities they're doing these same kind of promotions with cows and with birds and fish and chairs and everything, they don't seem to have the same kind of intimate sort of attractiveness that our Snoopys did last year and that our Charlie Browns do this year," says Koch. Charlie Brown is scheduled to hit the streets of St. Paul beginning June 3. They will be auctioned for charity in September, with the sponsors having an option to purchase them.